The linocut design concept is inspired by the author's close attention to small moments and details and her use of "nightmarish and crude" imagery and diction, including received phrases wedged into new and unexpected contexts, whereby the everyday strikes strange. The handprinted covers vary among a selection of blue, violet, and green shades, with inks ranging from silver and turquoise to lilac and deep indigo. The interiors are laser printed on bright white acid-free, archival-quality paper. Handsewn in natural twine. 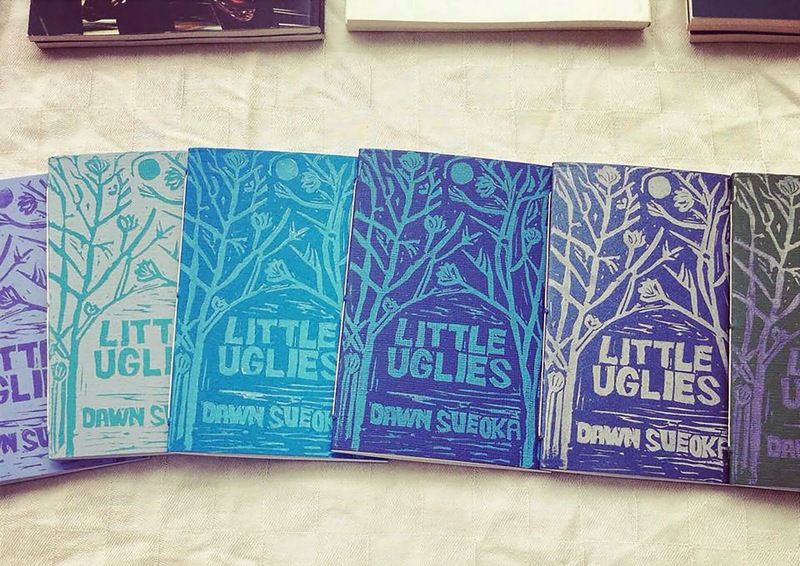 Litte Uglies is the fourth chapbook in the 2014 series from Bloof Books. Each chapbook in the series will be released in a limited edition of one hundred numbered copies, followed by a digital release. Dawn Sueoka’s work appears or is forthcoming in West Wind Review, Shampoo, smoking glue gun, Pinwheel, Birds of Lace 30 x Lace, and Coconut, among others. An essay on John Cage appears in Jacket2. She lives and works in Honolulu, Hawai‘i. Little Uglies is her first chapbook.